Daniel Sturridge insists he isn't getting too carried away after enjoying a productive pre-season for Liverpool thus far. But the striker is excited by the potential he and his teammates have shown throughout the ongoing preparations for the new campaign. Sturridge is back with the Reds after spending the second half of 2017-18 on loan at West Bromwich Albion, and has looked sharp during his summer friendly appearances. The 28-year-old netted his fourth goal of pre-season as Liverpool rounded off their tour of the United States with a 4-1 win over Manchester United on Sunday. Speaking after the game, the forward sounded a note of caution when reflecting on his recent form - no doubt giving some consideration to his past fitness issues. However, he could not completely quell his positivity, and told Liverpoolfc.com: "I just wanted to work hard through the summer. "[You come] back, work hard in pre-season, and try and help your team be successful - and that’s what it’s all about. "I ain’t getting too excited. I’ve got a positive mentality and I’m just focusing on improving because you can never stop improving. "It’s a great group of lads [and] it’s important for us to keep moving forward. "I feel good, I won’t deny it, but I understand it’s a long season too, there’s a lot of games, and I’m excited. "I’m looking forward to the future [and] what I can do and help the team." 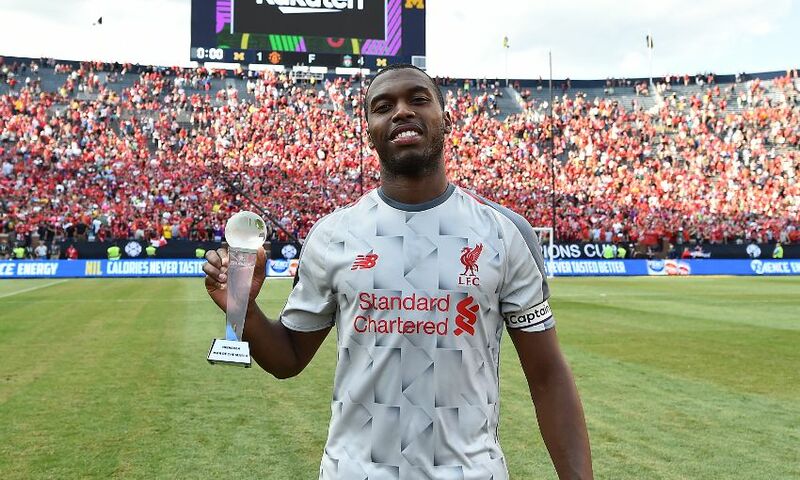 In recognition of his status as one of the club's longest-serving players, Sturridge took up the captain's armband following his introduction as a second-half substitute in Ann Arbor, Michigan. Asked about being given the responsibility, the forward spoke of his love for Liverpool and how that has been somewhat rekindled by his short stint away. "I said this the last time I was captain [against Blackburn], it’s a great feeling," he added. "I’ve been here a long time to be fair and it’s the longest I’ve stayed at one team in my professional career since Manchester City in the youth days. "As a professional, this is the longest I’ve ever been with a team and this has always been my home. "When you step outside sometimes it’s good to step away and come back with a fresh mentality and a new mindset and that’s the reason for me going away. "I never wanted to leave but I knew I had to, to try and get more minutes but now I’m back here to give it my all, to help us win something – that’s everybody’s aim, we want to win a trophy and that’s what we are focused on." Sturridge could have added a fifth goal to his personal tally for the summer had he not allowed Sheyi Ojo to take a penalty against Jose Mourinho's men after Andy Robertson was fouled in the box. On that decision, he said: "You know what it was, I looked over [to the touchline] and the gaffer was like ‘go ahead’ [but], Sheyi, it’s good for his confidence and also it’s a big stage as well for younger players. "For myself obviously I’ve played in big arenas and I’m not being cocky, I think for the younger players to get the confidence is good. "He was confident as well and he wanted to take it so if you show the confidence and want to step up then I’m not going to stand in your way. "I’m not greedy for the goals, it’s about sharing it around and everyone feeling good about themselves and everyone feeling a part of it. That’s what it’s all about."